Adds a simple menu and hotkey to allow the use of consumables on nearly any NPC. 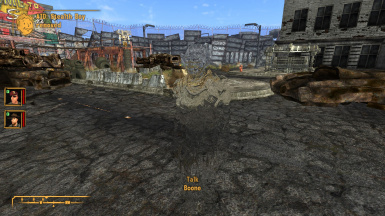 Heal NPCs, shoot up Psycho with Boone, or get drunk with Cass. Rebuilt how sorting is handled, should be more efficient/slightly quicker and make potential additions easier. Added a formlist to dictate a consumable as "helpful". Adding an item to this list will allow its use on non-teammate NPCs as long as it is not addictive. Items here will be placed between medicines and other consumables, still sorted alphabetically. Renamed Repair Kit to Robot Repair Kit. Moved output items around for the "Robot Repair Kit" recipe so the icon displayed will be that of the Robot Repair Kit instead of the wrench. Added Robot Repair Kit; can be crafted at any workbench with a repair of 30 or higher and 1 of scrap metal, scrap electronics, wonderglue, and wrench. The wrench is not consumed. Fixed an error that would allow the Use Menu to be opened when not having a NPC selected. Rewrote messages to be more immersive (i.e. "You can't use Stimpak on ED-E." to "ED-E can't use Stimpak." and "You can't use Whiskey on Sunny Smiles" to "Sunny Smiles refuses your Whiskey."). Improvements to Advanced Hotkeys menu. You can now remove a single Advanced Hotkey instead of having to erase them all. Added advanced hotkeys; items can now be assigned to hotkeys and used on a NPC instantly. Added exclusions formlist for manually excluding items from showing. General Use: Once ingame, look at any NPC and hold down the hotkey (by default, "-"). This will open a menu listing all valid aid items (see "Detailed Information" for more info). Once you click on an item, it will be used on the target NPC. 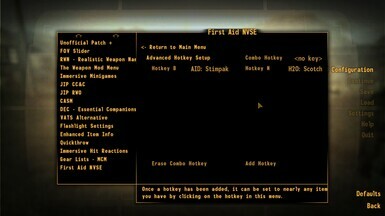 Advanced Hotkeys: Open the MCM and click on "Advanced Hotkeys Setup". Go down to the bottom and click "Add Hotkey". Press the key you would like to use, and once it is added to the menu, click on it and select the item you'd like to use when pressing it. The Combo Hotkey can be set, if desired, to try and prevent any hotkeys set from conflicting with hotkeys from other mods, if you are running short on free ones. After setting it up, all you need to do is look at a NPC and press the key. 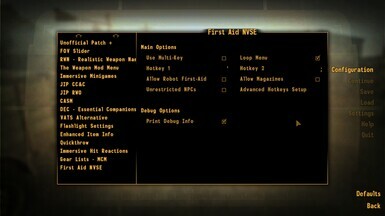 By default, there are a large amount of restrictions in place if the NPC you are performing First Aid on is not a companion or is a robot. For everyone, poisons and quest items can not be used. You can't use any items on a hostile NPC. 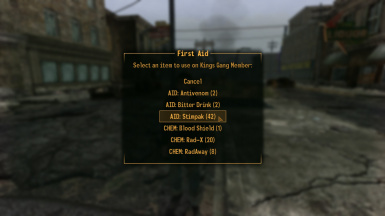 If they aren't a companion, you can only use medicines on them (Stimpaks, Doctor's Bags, etc). No addict-ables allowed. 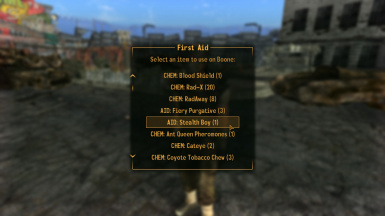 If they are a robot, you can't use chems, medicines, or food on them. Some items, such as Stealth Boys, can be used. The only restriction in place for non-robot companions is it can't be a magazine/skill book. 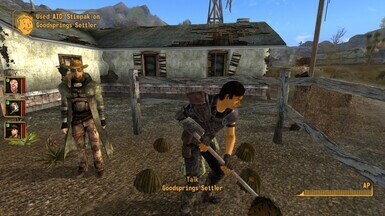 Want to shoot up some Psycho with Boone and Rex? You are of debatable morals, but go for it. A lot of these restrictions can be enabled or disabled in the MCM. Items will be sorted with medicines first, then alphabetically. would be a valid list.